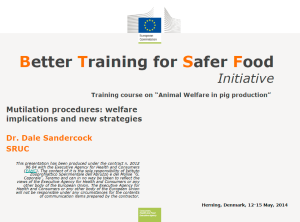 Dr. Dale Sandercock recently took part as a tutor along with Dr. Mette Herskin and Dr. Lene Juul Pedersen in an EU – Better Training for Safer Food (BTSF) training course on Animal Welfare in Pig Production in Herning, Denmark (12-15 May, 2014). The course was aimed at Official Veterinarians belonging to the NCAs (National Competent Authorities) of EU countries involved in official controls on animal welfare concerning the farming of pigs and the development of best practices to improve the application of EU standards. Dale presented a lecture on mutilation procedures: Welfare implications and new strategies. As part of the presentation he reported on the recent setting up of the FareWellDock project and it’s aims in relation to the issues of tail docking and tail biting. Dale was approached by several of the participants for more information about the project and he directed them to this website for further information. The course was attended by 53 participants (mostly from national veterinary institutes) from 28 EU, and candidate countries.